With a 5 Megapixel(5MP) resolution, you get twice the resolution of a 1080p Full HD camera, increasing the details within the camera’s field of view. 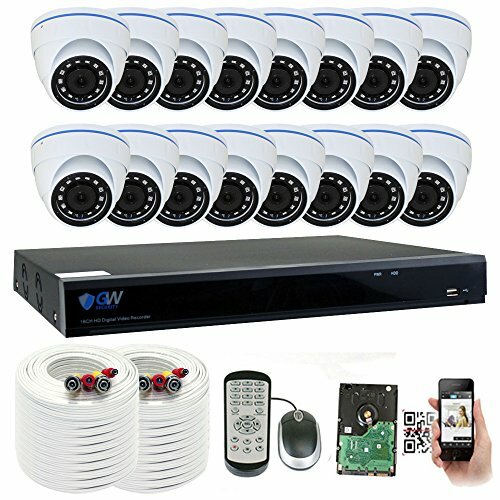 16 High Definition 5.0 Megapixel HD 1920p Heavy-Duty Metal Weatherproof IP66 Cameras for Amazing Video Quality and Clarity. Up to 1000ft Transmission Distance from Cameras to DVR. 80ft Night Vision Automatically Activates When Low Light is Detected. Includes 8 x 25ft and 8 x 100ft Siamese cables & Power Supplies. View and Record in Widescreen with Remote Viewing on iPhone, iPad and Android Devices by just scanning the DVR QR code (with included GW Security app). Remote Access on Windows PC and Apple Mac Using Standard Browsers (IE, Firefox, Safari) & Included GW Security Surveillance Pro Desktop Software. Pre-Installed 4TB Hard Drive (Expandable up to 16TB) for 15 Days Continuous Recording at Highest Resolution, Longer Recording Times Up To 60+ Days Available with Use of Motion Detection and/or Lower Resolution Settings. Smart search and playback to save your time. Intelligent motion detection email alert and easy USB Backup Feature for Peace of Mind. 1 Year Warranty and Free Tech Support within U.S.